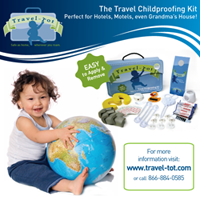 Travel-Tot is very excited to share what we believe to be one of the most important summer safety products out there: Sunscreen Bands! The team at Sunscreen Bands is dedicated to advocating for sun safety and educating about skin cancer. Their product, and the information contained below, are proof positive that Sunscreen Bands are a must-have summer product - so pick some up before your next family getaway! Skin cancer is 90% preventable. In the United States, 1 in 5 children will develop skin cancer; the team at Sunscreen Bands is determined to drastically reduce that statistic. Their patented color-changing technology monitors UVA & UVB exposure to remind you when to reapply sunscreen and when to get out of the sun for the day! Sunscreen Bands are now available nationwide at CVS, Walmart, Toys R Us/ Babies R Us, and Amazon.com, among others. Also, they are partnered with The National Shade Foundation and are endorsed by Parent Tested Parent Approved, National Parenting Center, and The Personal Care Products Counsel!